On 16/17 January ECMWF hosted a hackathon aimed at improving GloFAS by developing innovative ideas and approaches. More than 3.5 TB of data have been prepared, partly served in an OGC-compliant Web Coverage Service Standard (WCS) for easier data access and retrieval. In the EarthServer-2 project, this WCS service is currently set up at ECMWF and further institutions in Great Britain. FloodIT: Providing more intuitive information based on GLOFAS which helps forecasting local floodings and pre-empting a catastrophe. GloFAQ – Global Flood Awareness Queries: Innovative ways of providing end users with key information on potentially impacted infrastructures due to flooding. Interception: A flood awareness education platform which helps informing people about alternative courses of action when a flood watch/warning alert is issued. LIVE – Logistic and Infrastructure Visual Evaluation: Using GloFAS forecast information to create a ‘time to respond’ map. The (flooded) Italian Job: An automatised modification of fixed GloFAS thresholds for warnings. The winning team, LIVE, used GloFAS information creating a “time to respond map” that helps prioritizing decision making before or during a flood event. The second prize went to FloodIT, the third winner was Interception. The GloFAS system is currently used by the International Red Cross in a pilot project in Daares-Salaam, Tanzania for finance forecasting which enables Red Cross to spot early on where flood disaster support is required. 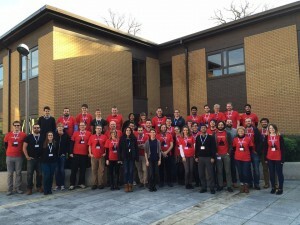 The FloodHack price money – in total 1,050 GBP – was donated to this project. On behalf of Geo for All , i would like to thank Julia and all our ECMWF colleagues for hosting an excellent event and all volunteers who gave thier time and time and expertise for helping improve the Global Flood Awareness System. Inspite of all the technological advancements, it is a sad fact that majority of the world’s poorest living in urban areas do not still have access to basic facilities (clean water, proper sanitation and hygiene facilities , good quality education opportunities etc). In order to achieve UN Millennium Development Goals it is essential to develop infrastructure facilities, strengthen the muncipal authorities and local city government organisations ( reduce corruption etc) in the developing world for helping improving the living standards of the people. GIS is fundamental technology in infrastructure development and high cost proprietary GIS is unaffordable to governments, town planners and local authorities in developing and economically poor countries. With the availability of free and open source GIS technologies it now offers a great opportunity for governments and municipal authorities in developing countries also to implement GIS tools for their decision making and implementation needs (without having to pay huge licencing costs to proprietary GIS vendors) and help improving the lives of some of the most poorest people and by giving the geospatial tools to the municipal authorities for their decision making and implementation needs will help in improving the living standards of the people. We need to empower people and communities (NOT enslaving them by continuing forcing them to pay high licencing costs) to make sure our future generations are fully empowered . Thanks to our Geo4All colleagues globally, we have already seen many examples of the potential of Geo technologies in empowering communities and helping improving the lives of some of the most poorest people . By capacity building staff and students and by providing the geospatial tools to the municipal authorities for their infrastructure upgradation programs etc ( which in the long term will result in providing clean water, proper sanitation and hygiene facilities, electricity etc) will help in improving the living standards of the people. It is with these aims that the Geo4All community decided to work on OpenCitySmart – The Open platform for Smart Cities. Thanks to the leadership shown by Patrick Hogan (NASA) and Prof.Chris Pettit (University of South Wales) and our amazing team of volunteers, we are now rapidly expanding this in collaborations with universities, government organisations and industry. Open City Smart builds and uses open solutions to build richer toolboxes that empower organisations and people all around the globe to handle spatial (and non-spatial) data.This will create innovation opportunities globally and locally. For example, the startup community is especially open to the use of open software and data avoiding huge licensing costs and restrictions which may impact on their business plans, raise early start-up costs and restrict their ability to innovate and it frees them of the need to use proprietary software and data allowing them greater branding freedom and product flexibility. If you look through our Geo4All labs lists, you will see there is already good examples of cross fertilisation of activities from universities/industry happening. For example, the Open Source Geospatial Laboratory at ETH Zurich  is linked with SourcePole  and more university labs are working to expand collaborations with industry and also help their students to create more startups in the future expanding the digital economy creating more highly skilled jobs both locally and globally . If you look at OSGeo UK Chapter and there are now many SMEs in the UK (generating hundreds of highly skilled jobs) who are service providers  and doing training  etc in this and we need to think of ways to expand more opportunities and help create more new highly skilled jobs locally and globally . GeoforAll have at our disposal all the most advanced and powerful geospatial software from the Open Source Geospatial Foundation, NASA’s World Wind, AURIN’s What if and many more open solutions (build on open standards and open data) to build richer toolboxes that empower people all around the globe to handle spatial (and non-spatial) data for Open City Smart. We also have dedicated global infrastructure through over 100 ICA-OSGeo-ISPRS research labs now established across the planet in the top research universities (mostly in USA and Europe but we are rapidly expanding in Asia and globally) and more importanly we have the amazing, dedicated and talented people power making this happen. So we warmly welcome you to join us and expand collaborations through joint research projects and bids that our colleagues are actively working on. If you and your research group have the expertise in urban science, smart cities, and wish to be part of these collaborations, please make you add your details and expertise to our list at https://wiki.osgeo.org/wiki/Opencitysmart and we will contact those with needed expertise for our various bids (to H2020, NSF and other national research funding organisations) that we are working on. We will have a dedicated session on OpenCitySmart at the GeoBigData workshop organised by the Geospatial IG of the Research Data Alliance https://rd-alliance.org/groups/geospatial-ig.html on 8th June 2016 at University of Nottingham (coinciding with RDA Chairs meeting which will be hosted jointly by the University of Nottingham and British Geological Survey in Nottingham). You can view overview of OpenCitySmart at https://www.youtube.com/watch?v=aWuMfMMPfPw (This was presented at European Space Agency’s Earth Observation Science 2.0 conference at ESRIN, Frascati, Italy) . Thanks to Ant Beck for the video. On behalf of “Geo for All” , we would like to welcome strong global participation for the fourth edition of the NASA Europa challenge. The aim of this challenge is to inspire ideas for building great applications that serves the INSPIRE Directive and uses NASA’s open source virtual globe technology World Wind. We thank Professor Maria Brovelli (Politecnico di Milano, Italy) and Patrick Hogan (NASA) for their efforts for this initiative which adds great momentum to our efforts to promote openness in education and research worldwide. The Europa Challenge has always had Europe’s INSPIRE Directive to guide project development. This year we continue to have INSPIRE guide us and more specifically, we are looking for solutions specific to urban management. The CitySmart Europa Challenge is challenging the world’s *best and brightest* to deliver sustainable solutions serving city needs. Almost every city needs the same data management tools as every other city. How can we help cities work together to be more sustainable, more livable and more resilient? If cities were able to share their solutions with each other, this would multiply their investment by the number of cities participating. Each city could develop different functionalities and then ‘share’ these with each other, massively increasing our planet’s collective productivity. Simply build a great application that serves some aspect of the OpenCitySmart    design and uses NASA’s open source virtual globe technology, WebWorldWind. Whether you win or not, you will advance a platform that allows every city to win! This challenge is open to all on our home planet. See the 2015 Projects, 2014 Projects and 2013 Projects. China had top teams these past two years, India had an excellent team last year and Italy every year! A USA High School team from Alaska won First Place in 2015! So students and SMEs are welcome to join the competition this year. This year’s Europa Challenge is an excellent opportunity for the global community to begin working in collaboration and prepare for the increasing climate change scenarios in cities context. Students are our future and looking at previous year’s contributions from Global Earthquake forecasts systems ( developed by some high school students from Alaska who went on to win the first prize in 2015!) http://www.edlinesites.net/pages/America_Bridge_Project/Europa_Challenge to Urban Traffic Visual Analytics Simulator , it just shows the amazing contributions of these students and SMEs made for the global good and for the benefit of all. We look forward to your strong participation for the NASA CitySmart Challenge 2016 and joining our mission to make geospatial education and opportunities available for all. Also i take this opportunity to welcome our new OSGeo President Professor Venkatesh Raghavan and our new Vice Presidents Professor Helena Mitasova and Dirk Frigne. By coincidence, i was reading the United Nations report on Future trends in geospatial information management: the five to ten year vision report that some colleagues send me this week . It is very interesting and relevant.